I agree with manu962 that there’re a lot of sad scenes, but what do Du mean with „sad“? Below I’ve choosen the scenes I have oder would cry the most, not the scenes which are sad, because of the circumstances. I can’t remember all scenes in every BM, so this is just a small selection. 1) Mariposa: The magic cave where Zinzie, Rayla, Rayna and Mariposa have to choose. Every step is sad, especially where Mariposa finds the Lost star, sterne in the starry and understands she's in spite of everything important. 2) Weihnachten Carol: Eden meets her future and decides to change her life. 3) Rapunzel: In the tower as Gothel destroys Rapunzel’s pictures, paint paraphernalia and dreams. 4) Magic of Pegasus: The reunion between Brietta and her parents. 5) 12 Dancing Princesses: To see how King Radolph’s health is getting worse. 6) Thumbelina: The excavators are ready to cut down the forest. 7) rosa Shoes: Kristyn can’t find Hailey and is destroyed on the ground. 8) Island Princess: „I need to know“ and the conversation between Ro and Tika, because Tika has stolen the letter of the Prince. And the reunion of mother and daughter. 9) Nutcracker: Clara sagte to Eric that he’s Mehr than a Nutcracker and realizes that she’s the sought Sugarplum fairy and breaks the spell. 10) Princess and the Pauper: „Free“ and Erika sings in the cave. „On oben, nach oben of the world“ and „I wish I had her life“ should be also at this list. Summed Von the number of sad scenes, in my opinion the saddest Filme are: Island Princess, Mariposa, Weihnachten Carol and rosa Shoes. Especially Weihnachten Carol. 1.Rapunzel's crying and saying "Why?Why?" while holding her broken paintbrush. 2.Erika Singen "To be a Princess" in the prison and crying. 3.Liana trying to wake the hypnotized Alexa up. 4.Ro stopping the dance with Antonio and leaving the ball. 5.Elina thinking she'll be a mermaid forever. 7.Eden "crying" in her room after she remembered what Aunt Marie did to her. 8.Genevieve finding her father "dead" in his bed. 10.Barbie from BD playing the gitarre after she loosed her friends. The scene where Ro and her mother unite also makes me cry but I didn't add it here since it's a happy scene. It is from Fashion Fairytale. Agh, hard question. 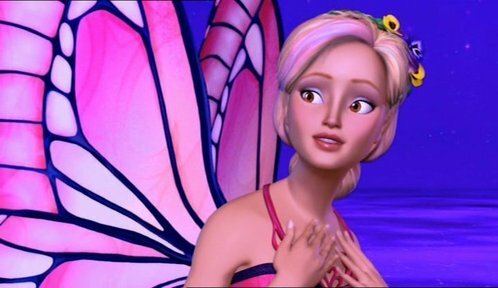 I cry in almost every Barbie movie. 1. Catherine calling Tammy outside the orphanage in Eden's possible future. 3. Erika Singen and crying in the dungeon. 4. Kristyn falling to the ground and crying because she Lost Hailey. 5. Rosella leaving the ball and also Antonio. 6. Blair running away from the Gardania schloss in tears. 7. Odette fainting and falling to the ground as Daniel declares his Liebe for Odile. 8. Merliah deciding to sacrifice her human side to save the ocean. 9. The Another Me scene in Fashion Fairytale. 10. Rowena destroying the way out of the magical world. These are basically a few of the scenes that I cry while watching them.